Please take a moment to view the following videos specially created to speak well of God in a visual format. To play the videos below, simply click on the image representing the video of choice. The video will open up in full view on your browser. Simply press the play button to play the video. Once done, you may use your browser’s back button to come back to this screen to continue viewing more videos. “Conversations About God” is a recorded series of twenty Friday evening discussions with Graham Maxwell based on the conviction that the most important of all beliefs is the one that brings joy and assurance to Christians everywhere — the truth about our Heavenly Father that was confirmed at such cost by the life and death of His Son. This is our invitation to you to join us in another look at God — in the larger view of the universe-wide controversy over His character and government. #02 What Went Wrong In God’s Universe? #19 How Soon Will The Conflict Be Over? This series of eight half-hour videos offers a respectful and informative response to questions people are asking about God. And to those who may have decided that God is not worth thinking about at all, it offers an invitation to take another look at God and another look at the Bible as a readable and trustworthy source of information about God. Could there be a God who values our freedom as much as we do ourselves? One who desires our friendship rather than fear? Our intelligent trust, not blind submission? 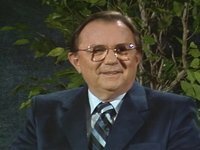 At the time the series was recorded (1986), Dr. Maxwell (Ph.D., University of Chicago Divinity School) was a professor of Biblical Studies, New Testament at a California University. 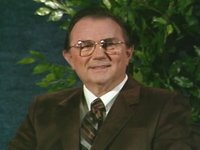 Dr. Gallagher (Ph.D. St. Andrews University) was a minister of a church in Norwich, England. The videos were filmed in a studio in Knutsford, England. #01 Do You Like Your God? #02 Can the Bible Be Trusted? #03 Can Bible Translations Be Trusted? #04 Can the Meaning Be Understood? #05 What Does God Want of Us? #06 What Basis is There for Trust? #07 Would You Be Afraid to Meet God? Is the Christian era ending in Great Britain? Polls say that 97% of the 56,000,00 people no longer believe in God or attend church anymore. This video is the result of 13,000 miles of driving around the beautiful British Isles to see the hundreds of churches abandoned, sold, and converted to all kinds of uses — even a pub! But most of all to see the people — all kinds of people — from children to Oxford scholars, from a Cornish baker to a Scottish gravedigger — and to a muscular motorboker who gave surprising meaning to that friendly English phrase, He’s one of the lads. Why are the churches empty and the pubs so full? Is Britain lapsing into paganism? Can this be reversed? Is anyone succeeding? Enjoy over three hours of colourful and entertaining evidence.